I have not been doing many crafts until fall hit and now we cant stop. I think I may be trying to spend as much one on one time with my boys as I can before the new baby arrives. Crafts are something we enjoy so we have been busy. brown and orange construction paper, fabric leaves, glue, scissors, marker. 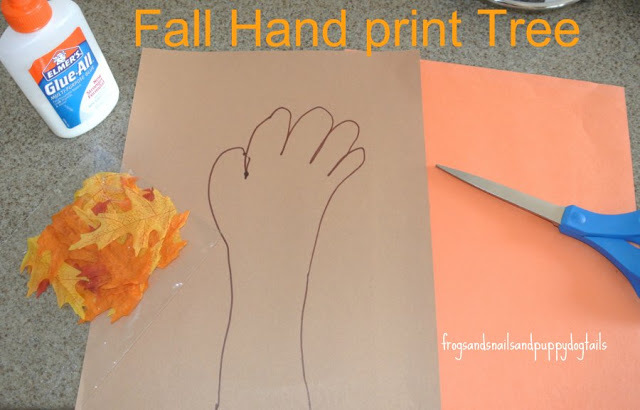 I traced my sons hand and arm on brown paper then I cut it out. I let him glue this down to the orange paper. He then took a green marker and drew a “tree” on top of the brown hand print or tree trunk. Next he moved on to gluing his fabric leaves on his tree. He glued some on the side and said they were falling leaves. This is what he ended up with. As a mommy I think he has one cute fall tree. We hung it up on the cabinet to help add to the fall decor in the house. We always hope you and your kids may have some fun with our craft too. Oh, I love it!! We will definitely have to give this a try. Thank you so much for sharing at Sharing Saturday! How fun! My son loves anything to do with his handprints. He would like this for sure.